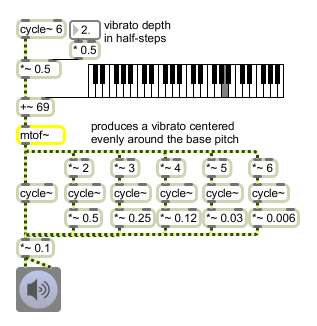 mtof~ performs signal-rate MIDI-to-Frequency conversion. signal A signal representing a MIDI note number value (from 0 to 127). The corresponding frequency is output as a signal. base float Sets the "base frequency" used when calculating frequency values (e.g., A = 440.). The default is 440.
signal: The frequency corresponding to the received MIDI pitch value, output as a signal.